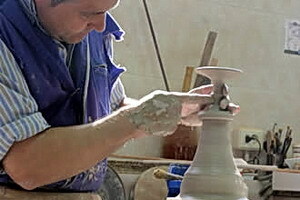 Buño, in the Costa da Morte region of Galicia, is famed for its potteries. The whole village appears to dedicate themselves to this ancient craft and it is certainly the place to go to find gifts to take home with you. From the 12th to the 20th of August a major exhibition is held where the "traditional firing" takes place in the ethnographical complex known as "Forno do Forte" and which includes "A Carroa", a fish based meal.